I know there's lots of noise about rushing the season, but memories of last year's cold are still a little too vivid for me! I'm thinking of taking my family out this weekend or right after Thanksgiving to check out the Detroit Zoo's Wild Lights display. When: November 22-24, 28-30 and December 5-7, 11-14, 18-23 and 26-31. 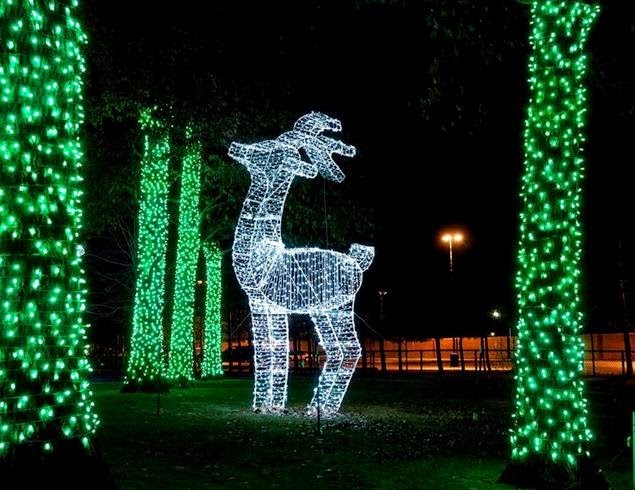 Event Features: Experience the magic of the Detroit Zoo in winter as you take in the lights and the sights with more than five million LED lights that will illuminate trees, buildings and more than 100 animal sculptures throughout the front of the Zoo. Guests can enjoy a variety of activities including a craft, carolers, ice carvers and can even write a letter to Santa. The Detroit Zoo also invites guests go on an extraordinary adventure in the Wild Adventure Zone with "The Polar Express 4-D Experience" at the 4-D Theater. If you purchase your tickets before November 21, you'll even be entered to win a family four-pack of tickets to Dinner with Santa at the Detroit Zoo! You can buy tickets here. Also, whether your car is at 500 or 5000 miles, Valvoline Instant Oil Change is encouraging everyone to visit one of their 14 Metro Detroit locations to prepare for winter. 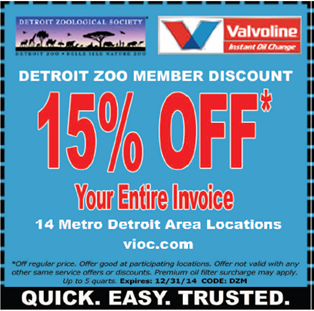 Use your Detroit Zoo membership card to save 15% off of your entire invoice. Please use the coupon below.